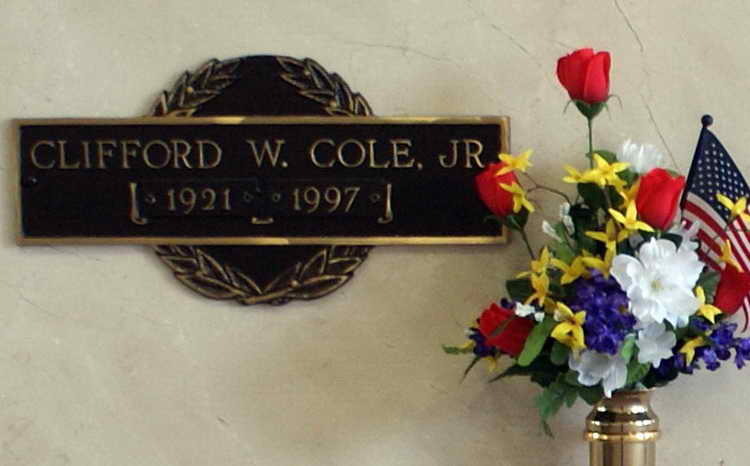 Grave marker for Clifford W. Cole. Jr. in Tranquility Mausoleum Interior, Oak Bluff Memorial Park, Port Neches (Jefferson county), Texas. Clifford enlisted in the Army at Fort Thomas, Newport, KY on 11 July 1942. On 30 November 1942 Pvt Cole was transferred from the Parachute School, Fort Benning, GA to Hq rd Battalion, 508th PIR. On 26 August 1943 Pvt Cole was elevated to the grade of T/4, a grade that he held for the remainder of the war. While the regiment was stationed in England, T/4 Cole was placed on detached duty with the 2nd Airborne Brigade MP Detail from 15 March to 22 May 1944.